Allen Street has a variety of picturesque houses. As well as row houses, Allen St has a variety of picturesque effects. Some have outstanding woodwork. 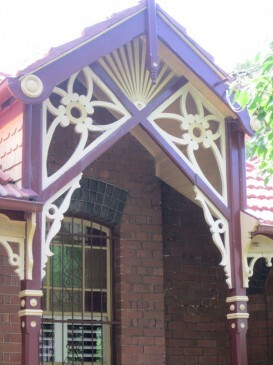 Bega (1902) No 35, has a double-flower burst in the gable and leadlights in the door, and No 36 has brackets of delicate tulips on the wooden columns which wrap around the side as well. The unusual bay addresses the side and the front. Opposite is No 19, Hazeldene(1899), asymmetrical with a faceted bay, and similar glazed painted tiles on the risers of the steps and lining the door recess.